The term holocaust, with origins in the Greek translation of the Hebrew Bible, translates the Hebrew expression olah as holokauston, meaning "a burnt sacrifice" (Berenbaum 2000, p. 31). Deeply imbued with religious meaning, the expression is presently most closely associated with the Nazi policy of mass murder directed against European Jewry. In a century when over 140 million people died in wars, the Holocaust may long be the ultimate symbol of inhumanity. The meaning of Holocaust is itself fraught with great controversy. Some, like the historian Walter Lacquer, insist that the expression is "singularly inappropriate" because of its religious connotations (Lacquer 1980, p. 7). Elie Wiesel, a survivor of Auschwitz and the Nobel Prize–winning author of Night (1960), is often credited with introducing the word into popular usage. In the face of this religious qualification, the term remains widely used by academics, the media, and the larger community. Wiesel has since expressed great concern over the abuse of the term applied to situations beyond the historical context of the Third Reich and the experience of mass destruction experienced by the Jews. Just as important, Wiesel reminds readers that the term Holocaust, like any expression from human language, invariably falls far short in encompassing the sheer horror and depth of tragedy behind the persecution and mass death inside and outside Nazi concentration and death camps. Poets and historians still search for words to explain the unfathomable atrocity. The history of the Holocaust reflects the reality that Adolph Hitler and the Nazi movement did not invent anti-Semitic hatred against the Jews. What was unique in the Nazi experience was that the Third Reich was the first and only regime in modern history to define anti-Semitism in racial terms and, upon this basis, to use the full weight of the state to legitimize the Ausrottung, or eradication of the Jews. Racial bloodlines defined the essential difference between Aryan Germans and Jews. This distinction, in the words of Victor Klemperer, a philologist and shrewd observer of Nazi language, was everything. What set National Socialism apart from other forms of fascism "is a concept of race reduced solely to anti-Semitism and fired exclusively by it" (Klemperer 2000, p. 135). The racial state conceived by the Nazis as a foundation stone for the Holocaust defined citizenship in biological terms. As one prominent Nazi race eugenicist argued, "National Socialism is nothing but applied biology" (Baur, Fischer, and Lenz 1931, p. 417). Part of the Nazi success in rising to power in 1933 was the union of racial science from the late nineteenth century with traditional religious and economic forms of anti-Semitism rooted in the Middle Ages. From its inception racial science took on an international character. Appearing only about six months into the regime, the Nazi Law on the Prevention of Hereditarily Ill Progeny, which legalized compulsory sterilization, drew from a notable legislative model in the numerous compulsory sterilization measures passed by twenty-four of the states of America under the aegis of the American eugenics movement, beginning with Indiana in 1907 (Kühl 1994, p. 17). The Nazi policy of destroying "life unworthy of life" under the banner of "scientific objectivity," of which sterilization was an early manifestation, would hold profound implications for others deemed racially undesirable, including Jews and Gypsies. Furthermore, Nazi propagandists exploited the long tradition of religious anti-Semitism in the Lutheran and Catholic churches. Jews were considered outcasts by both religious communities because of their refusal to convert to Christianity and for the charge of deicide in killing Christ. Martin Luther became an especially popular historical reference for Nazi propagandists who liberally quoted the religious reformer's incendiary pamphlet, "The Jews and Their Lies" (1543). Luther vented his rage against the Jews by drawing on old economic stereotypes depicting Jews as greedy moneylenders with an aversion to physical labor. The negative connotation of usury and lust for money, part of both Christian traditions, remained alive and well under the Third Reich. As vital as Jews were to the emerging market economy of Europe, they were still held as parasites and criminals. The social and economic power of anti-Semitic stereotypes like these was central to William Shakespeare's play The Merchant of Venice (1596), which portrays the rejection and suffering of Shylock, the Jewish merchant. Under the Third Reich, the new anti-Semitism, steeped in the language of race biology and yet connected to traditional hatred for Jews in the marketplace and church, provided an even more powerful ideological justification for persecution of a distinct minority. Anti-Semitism alone does not explain German Nazism and the Holocaust. Yet any serious consideration of what caused the Third Reich must take into account the dynamics of anti-Semitic thinking and their influence in shaping the formation and administration of Nazi social and political policies. Hitler's anti-Semitic agenda and the reality of the Holocaust did not assume definite policy directions overnight. Other contemporary factors played a significant role in bringing Hitler to dictatorial rule. Buoyed by the social and political malaise engendered by the Great Depression and skyrocketing unemployment and inflation rates, Hitler ridiculed democratic institutions and the lack of political unity under the Weimar Republic. Hitler also exploited the legacy of the Treaty of Versailles, which stripped Germany of pride and territories, and added the heavy weight of war guilt and reparations. All of these elements from World War I left a great deal of resentment among various elements in the German population. Here again, the Jews suffered from scapegoating and received blame for Germany's misfortunes. In what became known as the "stab in the back," Jews were even accused of causing Germany's defeat in World War I by working behind the scenes as betrayers on the home front. Historians and social scientists still struggle to understand how a country with one of the highest literacy rates in the world and a culture which nurtured great scientists, musicians, and theologians could administer one of the biggest mass murders in history, carried out with the complicity of millions and with the aid of the most modern technological means available. Indeed, the Germans were to industrialize mass death and the disposal of their remains. Germany was not the only country with a culture marked by deep-seated anti-Semitic resentments, but it was the only one to transform this resentment into a policy directed toward annihilating the entire Jewish people. Neither were the Jews the only group identified for total destruction because of racial reasons. The infamous "T-4" killings of the handicapped, the mentally ill, and those suffering from hereditary illness conducted by medical doctors under Hitler's orders preceded the formation of the death camps in the East. These were the first victims of mass murder. Under the guise of "euthanasia" and supported by the legal apparatus of the state, as many as 6,000 children and 70,273 adults met their deaths at the hands of medical professionals in asylums across the Reich. The vast majority of the victims died in gas chambers. The choice of method for this kind of murder was critically important for the future. The early Nazi elimination of "life unworthy of life" through the "T-4" killings foreshadowed the use of gas chambers in Auschwitz and other camps as well. Both the technology and many of the former medical personnel from this sordid experiment in mass murder would re-emerge with the SS, or schutztaffel, in helping to run the machinery of the death camps after 1941. The story did not end here. The intent to racially cleanse Germany of undesirable racial elements also extended to Sinti and Roma, called Zigeuner by the Germans and known traditionally as "Gypsies." Classified by the Nazis as "criminal"
Note: The numbers under discussion cannot embrace the full depth and scope of human loss which was the Holocaust. Controversy undoubtedly continues among scholars over the statistics representing the loss, of which Gerald Fleming's research is an important part. SOURCE: Fleming, Gerald. Hitler and the Final Solution . Berkeley: University of California Press, 1984.
or "asocials" and forced to wear the black triangle on prisoner clothing, at least 250,000 Sinti and Roma died under Nazi rule. Whether the Nazis fully intended to wipe out the entire population of Sinti and Roma remains an issue of some dispute among scholars. There existed no doubt among Nazi policymakers regarding the scope of mass murder and the massive destruction of Jews in the wake of the attack on Russia in the summer of 1941. The Nazi intention was to kill every single Jewish man, woman, and child. Hitler vented his obsessive hatred for Jews in Mein Kampf, ( My Struggle ) originally written in Landsberg prison in 1924. The Jewish community stood in diametric opposition to his racial vision for a New Germany. Judeophobia, as the scholar Klaus Fischer calls it, reflected a paranoid distortion of reality and delusionary thinking. After rising to power in 1933, Hitler wasted little time before moving against the Jews and other avowed enemies of the state. Dachau, the first of many concentration camps originally created to incarcerate political enemies of the regime, opened less than two months after Hitler came to office. The SA, or sturmabteilung, brown-shirted storm troopers, rounded up Social Democrats and Communists. The Nazis followed on April 1, 1933, by boycotting all Jewish businesses. Even more devastating to the Jewish community was the dismissal of all Jews from civil service and the legal practice six days later. The mass murder of Jews and others declared unworthy of citizenship did not take place overnight. State violence and terror, in order to be more fully institutionalized, required the legitimacy of a legal framework. Early on the perpetrators created a series of laws to legalize the oppressive actions taken against their victims. Compulsory sterilization laws appeared in July 1933 leading to the forced sterilization of over 320,000 people suffering from hereditary illnesses. Forced to wear the pink triangle and condemned under Paragraph 175 of the 1871 Reich Criminal Code, which made homosexual relations a criminal offense, at least 10,000 gays suffered imprisonment and deplorable treatment in at least eleven concentration camps. The legal noose continued to tighten around the Jews. A public book-burning of works by Jewish authors like Heinrich Heine and Sigmund Freud along with other opponents of Nazism took place in May 1933. Signs declaring "No Jews" sprung up all over the country during the summer of 1935 outside restaurants, stores, and villages forbidding Jewish entry. A critically important racial development emerged in September of that year under the anti-Semitic Nuremberg Laws. These laws virtually stripped Jews of citizenship, legitimizing the huge social chasm between Jews and Aryan Germans. With the intent of preserving blood purity, Jews could not marry and have sexual relations with Germans or employ female employees under the age of forty-five in their households. An equally ominous but perhaps lesser known aspect of the Holocaust regarded early reactions of the global community to the treatment of the Jews. At an international conference staged at Evian in France during early July 1938, diplomats representing thirty-two nations met to discuss solutions in answer to a growing refugee problem. The mounting number of Jewish refugees from Austria and Germany created pressure on the United States and other countries to raise immigration quotas. Little more than expressions of sympathy for the Jews came out of the conference. In short, the conference results convinced Hitler that "no one wanted the Jews" and, moreover, implied that he had a free hand in dealing with the Jews without international interference. Agrowing escalation of violence against the Jews occurred during Kristallnacht, or the Night of the Broken Glass, on November 9, 1938. That evening, over 1,000 synagogues across Austria and Germany were burned and many Jewish businesses looted and destroyed. Ninety-six Jews were murdered and 30,000 were arrested and sent to concentration camps in Dachau, Sachsenhausen, and Buchenwald. Eight days later, Jewish children were expelled from German schools. Economic pressures increased; the isolation of the Jews continued with the compulsory expropriation of their businesses, industries, and shops with the "Aryanization" of the economy in December of that year. The Final Solution, the Nazi answer to the Jewish question, did not follow a direct path from Hitler's obsessive hatred of Jews, as expressed in Mein Kampf, to the killing fields of the death camps. A major focus of Nazi policy from 1933 to 1941 was to use forced emigration to clear Germany of all Jews. At least as late as the closing days of 1938, the Nazi regime explored the possibility of organizing a wholesale migration of Jews to either Madagascar or Palestine. Some historians, like Gerald Fleming and Eberhard Jäckel, known in some quarters as intentionalists, claim a direct connection between Hitler's anti-Semitic ideology and anti-Semitic practices. Karl Schleunes, representing a more functionalist point of view, argues that the Nazi leadership from the top down had not defined the scope and substance of the Final Solution. Conditions of the war on the eastern front marked a critical phase in the Holocaust. Vast tracts of territory, along with huge numbers of Russian prisoners of war and Jews, fell under German control during the early phase of Hitler's war with Russia. Christopher Browning's research argues convincingly that Hitler gave the go ahead for the mass murder of the Jews in the fall of 1941, some four months after Germany attacked Russia. This distinction is important since it sheds new light on the old and misguided assumption that plans for the Final Solution were first instituted months later as part of the Wannsee Conference on January 20, 1942. Knowing when Hitler and his circle passed the point of no return in regard to killing Jews remains important for students of the Holocaust for several reasons. As Browning reminds readers, this extreme case of genocide was different from other genocides in that the goal was to eliminate every single Jewish person in the entire Reich and occupied territories. This genocide remains unique as a turning point in history for another reason. The Nazi regime exploited the latest technology as well as considerable bureaucratic and scientific resources to achieve the most thorough and efficient killing process possible. An important distinction existed between the formation of concentration as opposed to death camps within the Nazi racial state. Concentration camps originally imprisoned political opponents. Eventually, as racial enemies of the regime, Jews also became part of the prison population in the concentration camps. Death camps, of which there were six in number, were located in Poland. Their sole purpose was to kill as many Jews as quickly as possible. Auschwitz, Chelmo, Treblinka, Sobibor, Maidanek, and Belzec are places that will forever live in the memory of the Holocaust. Of these, Auschwitz was by far the largest. From at least 1.3 million deportees to Auschwitz, about 900,000 met their end very soon after arrival. Another 400,000 entered as camp prisoners and given identification numbers. About half of these people died of disease, hunger, or slave labor. Many of the remainder met their end by injection, medical experiments, or the gas chambers. Ninety percent of the victims in Auschwitz were Jews. Poles constituted the second largest group followed by Gypsies and Soviet prisoners of war. The geographical location of the death camps in the East afforded a certain level of official secrecy and deceit in the administration of mass murder. The six camps were located close to the highest concentration of Jews in all of Europe. Prewar Poland had a Jewish population of just less than 3 million. Auschwitz, which opened its gates as a death camp in 1942, was favorably situated because of its location at a confluence of major railroad lines. The railroads acted as major arteries to the death camps running from all parts of occupied Europe. Day and night Jews from twenty countries were shipped to their deaths. The railroads, in order to operate as efficiently as possible, relied on armies of trusted bureaucrats who, with the stroke of their pens, determined the fate of hundreds of thousands of people. These same faceless figures rarely witnessed the lethal results of their orders. SS Officer Adolf Eichmann, as master bureaucrat, was a central figure in this process since he designed and administered the entire transportation system for the purpose of speeding up the process of mass murder. The memoirs of Rudolf Höss, SS commandant of Auschwitz, reveal a kind and dedicated family man who felt no hatred for Jews. In the banal language of the brutally efficient bureaucrat, he simply had a job to do. The power of Nazi propaganda to work a language of deceit was an important factor in efficiently moving large groups of people to their unknown destinations. Victims were packed into cattle cars under the most inhumane conditions without food, water, or basic sanitation. To quell the threat of riots, Nazi officials informed passengers that they were part of a resettlement project. Showers, clean clothing, and hot soup were among those things promised at journey's end. Jewish musicians were pressed into service to play classical music at the gate of Auschwitz to soothe the anxieties of incoming prisoners. The real truth of the matter was hidden in an intricate language of deception. To make the situation even more precarious, Jews were required by law to wear the yellow star in September 1941. The Nazis developed no less than twenty-five expressions to mask the real meaning behind mass murder. Sonderbehandlung conveyed a literal meaning of special treatment. The expression really meant taking Jews through the death process in the camp. Arriving prisoners saw a welcome sign for Badeanstalten, or bath houses, which really were gas chambers. Not all Jews were killed in the camps. To facilitate the killing operations, the Germans initiated the Einsatzgruppen, or mobile killing squads under the direction of the SS. This newly formed "police army" swept through areas newly conquered by the German army in Poland and Russia. Thousands of Jewish women and children were hunted down and shot on the spot. Males were either executed or deported. This massive killing campaign, carried out primarily in 1942, demonstrated the highly concentrated methods used by the SS to eliminate as many people as possible within a relatively short timeframe. This was another face of the Holocaust which reflected the serious Nazi intent and purpose to carry out a war against the Jews. Several years would pass after the horrific experience of the Holocaust before survivors began to write about and discuss the meaning of their experiences. Survivor literature teems with many volumes of memories and poignant observations about the problem of being human under Nazi persecution. The writing of Elie Wiesel and Primo Levi, both Jewish survivors of Auschwitz, remain among the most popular authors from this literary genre. Wiesel's Night continues to be the most widely read recollection of the Holocaust. He captures his own adolescent struggle with his father while offering poignant observations about the problem of retaining some kind of humanity in Auschwitz. Perhaps one of the most excruciating theological questions raised by Wiesel concerns the existence of God. For him, the question about the presence or absence of God in Auschwitz remains unanswered to this very day. The sheer struggle for survival, also a powerful theme in Wiesel's writing, returned to Levi's experience in a most powerful way. His If This Is a Man (1986) recounts with great insight the culture of Auschwitz and the behavior of both perpetrators and victims. Under the shadow of hunger, disease, and fear, Levi describes the extent to which human beings regressed to the level of animal instinct to survive. There was for this man a larger lesson to be learned: "The story of the death camps should be understood by everyone as a sinister alarm-signal" (Wiesel 1986, p. 4). The importance of the survivors as teachers of succeeding generations cannot be overstated. The late existential psychologist Viktor Frankl, a survivor of four camps, influenced many readers with his theory about the nature of meaning and its relationship to suffering. Art symbolized another legacy from the survivors, including Alfred Kantor's 1987 collection of drawings depicting his experiences as a survivor in Auschwitz and Theresienstadt. Szyman Laks takes readers into the world of a musician in the orchestra at Auschwitz. His writing defies those who insist on finding a message of hope in the death camps. In Music from Another World (2000), Laks describes how the experience of being a musician, steeped in the classics and the daily smell of death, led some to despair. Until the 1980s the voices of women survivors were overlooked. A rich literature in poetry and verse relating the experiences of women in the camps by Carol Rittner (1993) and Ruth Schwertfeger (1989) offers readers new perspectives on the oppression of female populations. Another way of preserving the voices of survivors for future generations is being led by the pioneering work of the filmmaker Steven Spielberg and the Shoah Foundation. The group digitally recorded and indexed interviews with over 50,000 survivors. The realization is that, in only a few years, all survivors will pass into history. Exactly how many victims died in the Holocaust will never be known with great exactitude. Six million Jews lost their lives under the Nazi regime, a figure most commonly cited over the years by historians and social scientists. This statistical assumption continues to come under scrutiny. The historian Gerald Fleming argues with certainty that the figure reaches the 5 million mark (see Table 1). 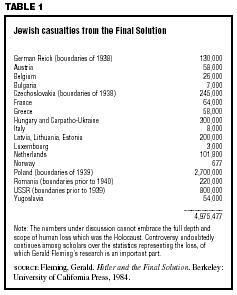 Raoul Hilberg proposes a slightly higher number of Jewish victims at 5.1 million. One important basis for determining the scope of human destruction in the death camps are the railroad passenger numbers and points of departure with dates carefully documented by the SS. While the toll of other twentieth-century disasters are often known to the single person, the loss of life from the Holocaust can only be estimated to within hundreds of thousands and millions. In some cases, entire Jewish communities in eastern Europe were wiped off the face of the earth. Noted earlier were the competing views of scholars regarding the intentional versus the functional nature of Nazi ideology and the Holocaust. Another voice, which emerged in the mid-1990s, sparked a firestorm of debate. Daniel Goldhagen's Hitler's Willing Executioners (1996) claims that anti-Semitic hatred, nurtured in the soil of Christianity, was the central cause for the Holocaust and that such hatred was imbedded in German culture. Goldhagen attacks the cherished assumption that Germans were guilty only of obedience to authority. Like many other institutions under the fascist process of centralization, the churches participated in an already deeply rooted German tendency toward "eliminationist anti-Semitism" (Goldhagen 1996, p. 23). Goldhagen's thesis came under withering criticism by a host of historians. The prominent German historian Eberhard Jäckel accused Goldhagen of advancing "primitive stereotypes" while making wholly inaccurate contrasts between anti-Semitism in Germany and developments in Italy and Denmark. Christopher Browning's scholarship emphasizes obedience to authority as a critical development leading to the Holocaust. He carefully contends that the demonization of an entire people with the charge of anti-Semitism explains nothing. Goldhagen's reductionist argument did not sit well among many historians. The controversial nature of the Holocaust, deeply embroiled in the causes and motivations for mass murder, promises new and expanded debates in the future. Appearing in the late twentieth century, certain revisionist historians like David Irving and Arthur Butz, members of the infamous Institute for Historical Review, exploited historical ignorance and nascent anti-Semitic prejudices by denying the Holocaust. Irving had long argued that Hitler remained ignorant of the Holocaust and Butz insisted that gas chambers did not exist at Auschwitz. The emergence of Holocaust denial as a cultural phenomenon, often reflecting an anti-Semitic agenda from elements of the Far Right, is not one to be overlooked or easily dismissed. A legal confrontation was inevitable. In 2000 a civil trial in London, where Irving sued the scholar Deborah Lipstadt for calling him a Holocaust denier, ended in disgrace for the plaintiff and a resounding public condemnation of Irving's historical claims about Hitler and the Jews by the judge. The controversy is not over. The language of anti-Semitic hatred continues to find audiences on the Internet under a growing number of web sites. In the Federal Republic of Germany and Canada, public denials of the Holocaust are considered expressions of hate language, incitements to violence, and insults to the dead. As such, these actions are considered serious violations of federal law in both nations. The long shadow of the Holocaust continues to shape world affairs. The tremendous sorrow, grief, and sense of betrayal from the Holocaust provided a powerful emotional and political thrust for Jews to create the state of Israel in 1948. Research protocols ensuring the protection of research subjects, growing out of the revelations of the Nuremberg trials, influences the way research is conducted today. Millions each year visit the extensive exhibits in the Holocaust and Memorial Museum in Washington, D.C. A new memorial in the center of Berlin, finalized after a protracted debate in the Federal Republic, will memorialize millions of Jews whose lives were lost in one of the most horrendous genocides in human history. The legal settlements over Swiss gold, which began in 1998 and continue into the twenty-first century, as well as reparations paid by German corporations who employed forced laborers raised a new awareness about the complicity of economic interests in the Nazi exploitation of minority populations. A deeper understanding about the human capacity for evil is an inescapable part of this legacy. Bauer, Yehuda. History of the Holocaust. Danbury, CT: Watts, 1982. Baur, Erwin, Eugen Fischer, and Fritz Lenz. Menschliche Auslese und Rseenhygiene. (Human Selection and Race Hygiene.) Munich: Lehmanns, 1931. Berenbaum, Michael. The World Must Know. New York: Little, Brown, 1993. Browning, Christopher. Nazi Policy, Jewish Workers, German Killers. New York: Cambridge University Press, 2000. Burleigh, Michael. Death and Deliverance: Euthanasia in Germany, 1900–1945. New York: Cambridge University Press, 1995. Carroll, James. Constantine's Sword: The Church and the Jews. New York: Houghton Mifflin, 2001. Fischer, Klaus. The History of an Obsession: German Judeophobia and the Holocaust. New York: Continuum, 1998. Fleming, Gerald. Hitler and the Final Solution. Berkeley: University of California Press, 1984. Frankl, Viktor. Man's Search for Meaning. New York: Washington Square Press, 1985. Fuhrman, Harry, ed. Holocaust and Genocide: A Search for Conscience. New York: Anti-Defamation League, 1983. Goldhagen, Daniel J. Hitler's Willing Executioners: Ordinary Germans and the Holocaust. New York: Knopf, 1996. Hilberg, Raoul. The Destruction of the European Jews. New York: Holmes and Meier, 1985. Hitler, Adolf. Mein Kampf (My Struggle), translated by Ralph Mannheim. New York: Houghton Mifflin, 1971. Höss, Rudolf. Death Dealer: The Memoirs of the SS Kommandant at Auschwitz. New York: DaCapo, 1996. Jäckel, Eberhard. "Einfach ein schlechtes Buch." Die Zeit, 27 May 1996, 24. Jäckel, Eberhard. Hitler's Weltanschauung: Entwurf einer Herrschaft. ( Hitler's Worldview: Outline of Power. ) Tübingen: Wunderlich, 1969. Kantor, Alfred. An Artist's Journal of the Holocaust. New York: Schocken Books, 1987. Katz, Steven T. The Holocaust in Historical Context, Vol. 1: The Holocaust and Mass Death Before the Modern Age. New York: Oxford University Press, 1994. Klemperer, Werner. The Language of the Third Reich, translated by Martin Brady. London: Athlone, 2000. Lacquer, Walter. The Terrible Secret: Suppression of the Truth about Hitler's "Final Solution." London: Weidenfeld and Nicolson, 1980. Laks, Szymon. Music from Another World, translated by Chester Kisiel. Evanston, IL: Northwestern University Press, 2000. Lautmann, Rüdiger. "The Pink Triangle: Homosexuals as Enemies of the State." In Michael Berenbaum and Abraham Peck eds., The Holocaust and History: The Known, the Unknown and the Reexamined. Bloomington: Indiana University Press, 1998. Levi, Primo. If This Is a Man: Remembering Auschwitz. New York: Summit, 1986. Piper, Francisek. "Auschwitz Concentration Camp." In Michael Berenbaum and Abraham Peck eds., The Holocaust and History: The Known, the Unknown and the Reexamined. Bloomington: Indiana University Press, 1998. Ritter, Carol, and John Roth. Different Voices: Women and the Holocaust. New York: Paragon House, 1993. Rosenbaum, Ron. "The Roots of the Holocaust Denial." The Wall Street Journal, 12 April 2000, 4. Schleunes, Karl. The Twisted Road to Auschwitz: Nazi Policy Toward German Jews, 1933–1939. Urbana: University of Illinois Press, 1990. Schwertfeger, Ruth. Women of Theresienstadt: Voices from a Concentration Camp. New York: Berg, 1989.